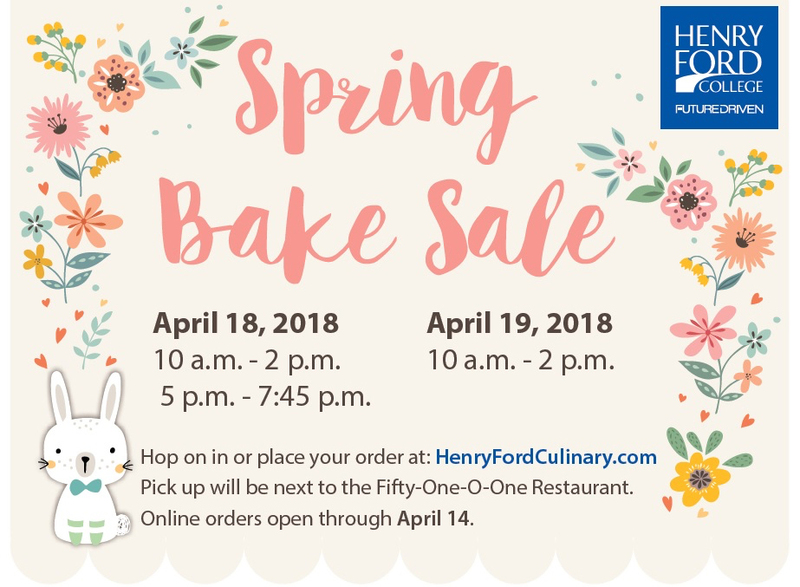 Fifty-One O One – the student-run restaurant at Henry Ford College – will hold its annual bake sale Thursday, April 18, and Friday, April 19, in the Student & Culinary Arts Center (Building M) on the main campus. The sale times are Thursday, April 18, from 10:00 a.m. to 2:00 p.m. and 5:00 to 7:45 p.m.; and Friday, April 18, from 10:00 a.m. to 2:00 p.m. If you've ordered in advance, you can pick up your items at these times. Pre-orders are available online through Sunday, April 18, at https://my.hfcc.edu/5101/bake-sale/form. Pick-up for pre-orders will be next to the Fifty One O One restaurant. For further information, call 313-206-5101.